As a milestone in the procurement process for the Hampton Roads Bridge-Tunnel (HRBT) Expansion project, the Virginia Department of Transportation (VDOT) has announced the project will move forward with the bored-tunnel construction method to deliver the next connection across the Hampton Roads harbor. 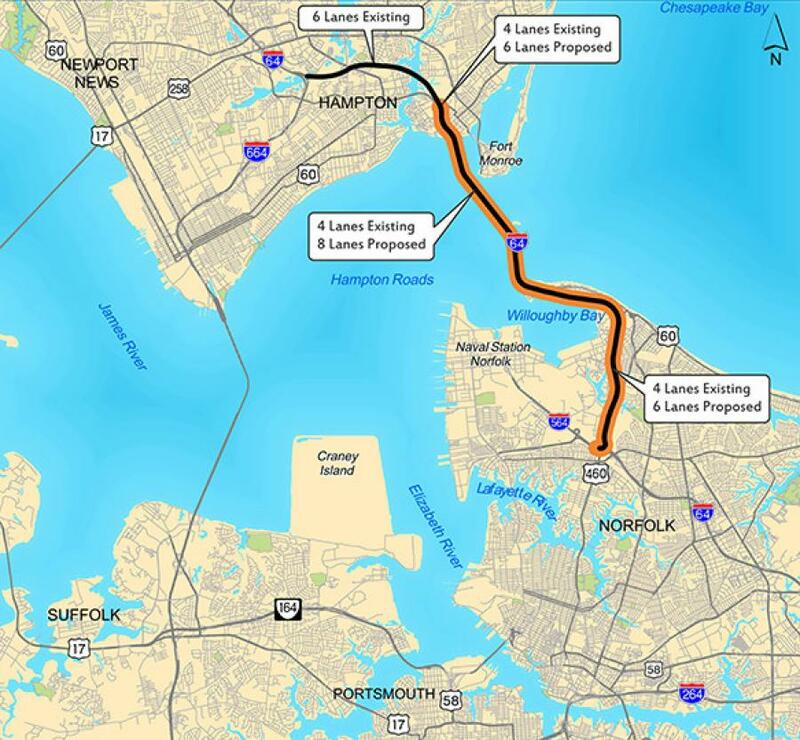 Both competing teams — Hampton Roads Capacity Constructors and Hampton Roads Connector Partners — notified VDOT they selected the bored-tunnel method as the basis for their bid proposals, which will be submitted in late 2018. "The selection of a bored tunnel means Hampton Roads will see some of the world's most sophisticated tunnel technology at work. Once complete, this new crossing will greatly improve accessibility, transit, emergency evacuation and military and goods movement along the I-64 corridor," said VDOT Commissioner Stephen Brich. Although the immersed-tube method was used to construct all ten of Hampton Roads' existing crossings — from the original Downtown Tunnel in 1952 to the new Midtown Tunnel in 2016 — recent technology advances have now made bored tunnels feasible in the region's soft soils. The Parallel Thimble Shoal Tunnel, currently under construction at the Chesapeake Bay Bridge-Tunnel, also is being built as a bored tunnel for the Chesapeake Bay Bridge-Tunnel Commission. This technology involves a massive tunnel-boring machine, or TBM, with a rotating cutting head that excavates soil along the tunnel's path. Advantages of this construction method include significantly less environmental impact to marine wildlife than with the immersed-tube approach, which would have required dredging a deep, mile-long trench across the Hampton Roads waterway. In addition, because the tunnel-boring machine excavates from beneath the riverbed, this technology greatly reduces disruption to commercial and military shipping in one of the nation's most important navigation channels. The project represents VDOT's first bored tunnel. In addition to HRBT and the Thimble Shoal project, other bored roadway tunnels in the United States include the Port of Miami Tunnel and the Alaskan Way Viaduct Replacement in Seattle, Wash.
For more information, visit hrbtexpansion.org/.